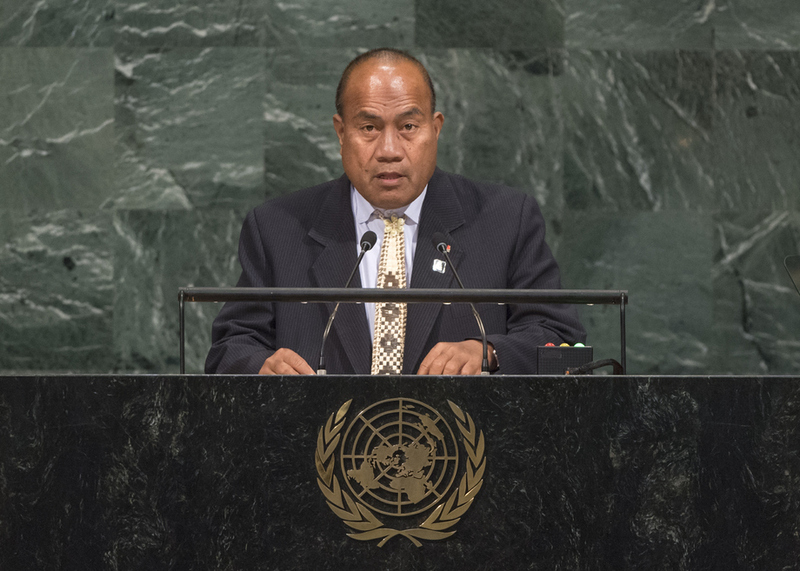 TANETI MAAMAU, President of Kiribati, said the Assembly’s theme was central to ensuring that human lives and dignity prevailed “over the value of a dollar”. “As leaders of our sovereign nations, we are responsible to our people who are at the heart of the sustainable development agenda,” he stressed. As the international community addressed the loss of lives and devastation in the Caribbean, Mexico and the United States due to the onslaught of hurricanes and earthquakes — and typhoons and monsoons in Asia — he urged it not to forget the plights of countries such as Kiribati. The country, along with other small island developing States including Tuvalu, Marshall Islands and Maldives, suffered daily from the onset of climate disaster. “This may not capture the attention of the global community due to its slow impact and limited media attention, but it is causing pain and suffering in our communities,” he said. Calling for simplified and streamlined international processes that enabled the participation of such nations, he said easier access to the Green Climate Fund was also needed. Kiribati had embarked on an ambitious “20‑year Vision” strategy towards a wealthy, healthy and secure nation based on accelerated growth and strategic investment in human, natural and cultural capital. That plan aimed to empower people at the household and community levels, he said, also outlining national policies to ensure good governance and transparency. Noting that the United Nations could not speak about a focus on people if its own family remained incomplete, he said its pledges of consolidation and concerted action continued to ignore the 23 million people in Taiwan, depriving them of the right to participate in its work. Calling for reforms that would see Taiwan included in the global community and its drive to achieve the 17 Sustainable Development Goals, he went on to note that unsustainable production and consumption patterns “will push our planet’s life support system to the brink of collapse”, and urged collective action to reverse them. Efforts were also needed to conserve the ocean. He welcomed the inclusion on the Assembly’s agenda of action to formulate a legally binding instrument for the management and sustainable use of biological marine diversity areas beyond national jurisdiction, noting that a single management failure in those important areas could have devastating consequences on fisheries and the ocean itself. For its part, he said, Kiribati had declared 11 per cent of its exclusive economic zone as a marine protected area, a non-commercial zone and a world heritage entity under the United Nations Educational, Scientific and Cultural Organization (UNESCO), with the aim to foster a restocking of its fisheries. “If a small, resource-constrained nation like mine is willing to make a profound sacrifice […] this global family has a far greater capacity to do more” to ensure that future generations could build a decent life in a sustainable environment. Calling for support to help countries mitigate and alleviate the effects of climate change, he announced his Government’s decision to leverage its sovereign wealth fund as collateral for concessional debt financing. That non-traditional move demonstrated Kiribati’s willingness to drive its own aspirations rather than wait for financial assistance “that may come at a moment far too late,” he said. Cautioning against diverting the United Nations focus away from people to countries’ individual quests for power, dominance and greed, he said compassion could transform global challenges by focusing on the most vulnerable members of societies. “We come to this gathering to listen and converse,” he said, adding: “Let us do so with greater compassion, understanding, love, respect and kindness.” It was never too late to begin.